Attention spans are short these days and people are ever-looking for more resourceful ways to maximise the time they have. Traditional levels of tolerance for long-form digital content are getting lower all the time, and many of us regularly find ourselves in situations in our professional lives where we have to read a huge amount of text but simply don’t have the time to take it all in. For instance, a student working on an assignment with a mountain of books and articles to get through, or a journalist or market research analyst with piles of reports to read just to get an overview. That’s where Summarizer comes in. Summarizer by Connexor is a free time-saving cloud based solution that utilizes sophisticated syntactic analysis technologies to form accurate and meaningful summaries instantly. The user interface could not more intuitive or streamlined-all that is needed is an internet connection and some content, and within a few clicks you have a concise synopsis that can be shared over Facebook, Twitter or pasted back into your editor of choice. Whilst there are a number of text analysis solutions out there trying to achieve the same thing, most of them combine low-end linguistic technologies with inaccurate statistical pattern matching techniques to discover relational information. The result is often inaccurate and not what the reader is looking for. Summarizer’s pedigree is different. 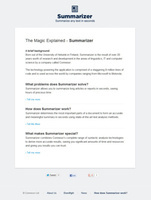 Born out of the University of Helsinki, the algorithms powering Summarizer are a result of over 20 years worth of research and development in the areas of linguistics, IT and computer science by one of the world’s leading content analysis and linguistics technology providers-Connexor. Traditionally an enterprise and custom solution provider, Connexor has established itself firmly as an authority in the field with a client list that includes Microsoft, SAS, Toshiba, Nokia, General Electric and Pearson Education. Connexor’s technology uses a range of text analyses, including morphological analysis, syntactic analysis, event detection, topic detection and sentiment detection to create more accurate results. Now for the first time, this core technology is available to try for free, marking Connexor’s entry to a wider audience. 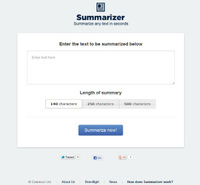 Summarizer is available to try in public beta mode here. No sign-up is required.